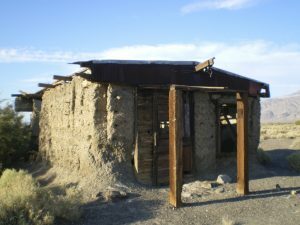 In the last installment I shared my discovery of the encyclopedia repository in the old mining camp of Reilly, California, and suggested camping in the nearby ghost town of Ballarat. Remains in Ballarat. Photos by Dave Helgeson. Ballarat is a forgotten mining ghost town. It was founded in 1896 as a supply point for the mines in the canyons of the Panamint Range to the east. A young immigrant from Australia named George Riggins gave Ballarat its name when he proposed it should be named for Ballarat, Victoria in the heart of Australia’s gold country. In its prime, Ballarat boasted seven saloons, hotels, a post office and more. But like most mining towns the mines played out and the town was mostly abandoned by 1917. 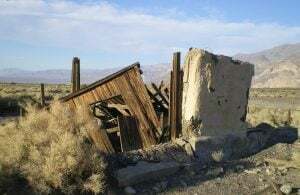 Today, all that remains are the crumbling remains of adobe walls, with the one exception being the “general store” where for a few bucks (bring cash) you can buy a cold soda and learn some local history from Rock Novack, the town’s caretaker. More remains in the old mining town. One colorful character that continued to call Ballarat home after everyone else abandoned the town was Charles Ferge, aka Seldom Seen Slim. Slim was a vanishing breed of prospector who, despite the extreme summer temperatures, spent more than fifty years living and working his claims in the area. Ballarat was his home until he passed away in 1968 at the age of 86. A darker story involves the old green Dodge Power Wagon permanently parked in town. The truck was driven by “Tex” Watson, one of Charles Manson’s followers, as he fled from nearby Barker Ranch prior to a raid of the ranch to round up the Manson family. The truck broke down as he made his escape forcing him to hitchhike back home to Texas. 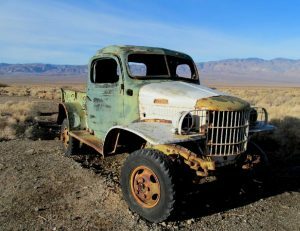 This old 1942 Dodge Power Wagon was said to be driven by Tex Watson, a follower of Charles Manson. Police eventually caught up with Tex and arrested him a month later. Pentagram, a symbol that the Manson family used to represent themselves, is drawn on the ceiling of the truck and is the only clue of the trucks dreadful past. The Barker Ranch is located in a canyon southeast of Ballarat now inside the boundaries of Death Valley National Park. It began as a mining camp and recreational property from the 1940s to the 1960s before being rented to the Manson Family. The Ranch burned in the spring of 2009 under suspicious circumstances. Travel the Trona Wildrose Road to N36° 02.020 W117° 16.898 where you will find the Ballarat Road. Travel east approximately 3.5 mile on the Ballarat Road to the ghost town of Ballarat and the Ballarat campground. Ballarat Road is suitable for any two-wheel drive vehicle and is currently being well maintained by a mining company operating south of Ballarat. However, the road is washboarded and if you choose not to navigate it with your RV, head two tenths of a mile north on Trona Wildrose Road to N36° 02.196 W117° 16.851 where you will find a turn-off heading east to a nice boondocking spot (pictured). You can then take your tow vehicle or dinghy into Ballarat. While camped in the Ballarat area you might be treated to an impromptu air show of fighter jets from nearby China Lake as they practice low altitude flights in the valley. Of course, eagle-eyed fans of the movie Easy Rider will also recognize the adobe hut above as the spot where Billy (Dennis Hopper) and Wyatt (Peter Fonda) stored their choppers while they went to Mexico for their drug deal. The Ballarat scene is the one where they stuff all their cash into plastic tubes and stash the tubes in their gas tanks . 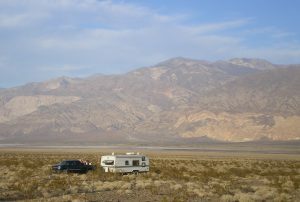 . .
And yes, Death Valley is definitely worth a spin through, along with Panamint Valley!